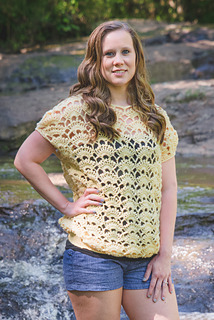 26 stitches x 4 rows = 6.5"x 2.5"
The Santa Rosa Tee is light and airy and perfect for spring and summer! 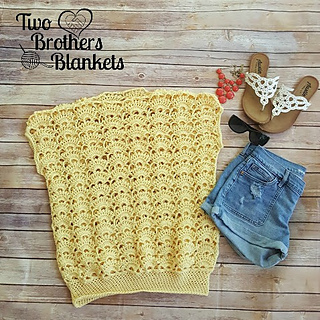 The beautiful shell stitching gives is a beachy vibe that can be dressed up or down! 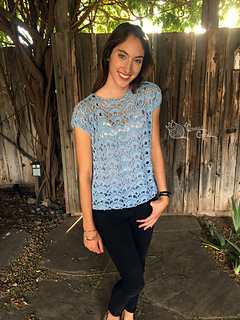 The Santa Rosa Tee is made with about 6” of positive ease but has a fitted waist band to make it a dolman style tee! This pattern does require some sewing. There is a link to a video tutorial and a schematic for you to follow. A schematic and photo tutorial within the pattern! Pattern support from me at anytime!